Sketch Markers come in all 346 colors. The replaceable Super Brush nib acts like a paintbrush in both feel and application. 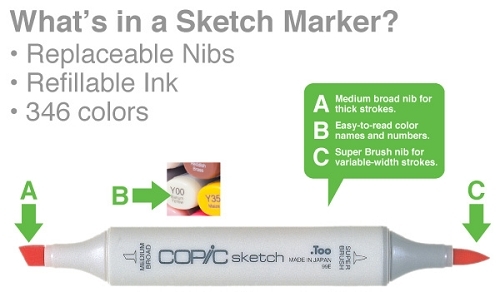 Sketch Markers feature refillable ink and optional nibs and are compatible with the Copic Airbrush System. Click here to download a PDF color chart.